Wilfred came up with a very flashy idea to spice up a Dutch carnival snare drum, instead of flashing random colors from high powered RGB LEDs he decided to make the LEDs fade along with the beating of the drum. Using an AT90S2313 microcontroller to induce the lighting patters and a piezo sounder as a microphone Wilfred gave a whole new life to the monotone snare. When the drum is hit, Pin3 of the MCu is pulled down through a Darlington pair, starting the fader’s sequence of flashes and fades. Alternate color patterns were use to give more emphasis to the fading transition plus giving a dancing light effect. If the hitting halts a heart beat sequence will automatically start after 20 seconds. Firmware for the MCU was written in BASCOM, for those of you who can’t compile in BASCOM Wilfred also provided the .hex file. 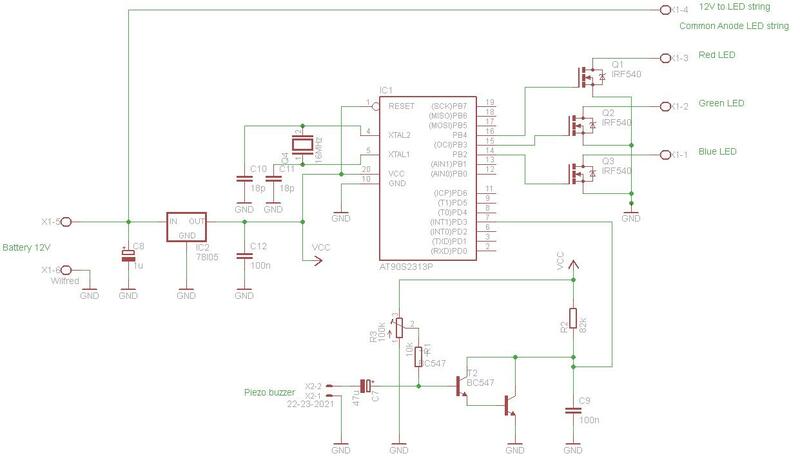 Schematics can be found here while a new untested board layout, in eagle cad is also available. Cheers! Drum lights just turned the Dutch carnival to a lively light-filled festivity. Tagged AT90S2313, flashy drum, LED fader.